Another season is quickly slipping away for the Camden Campbelltown Ghosts men’s first grade team. Still without a premiership trophy 33 years after entering the Sydney premier cricket competition, the Ghosts will need a mighty effort to make this year’s finals. Especially after three consecutive losses in a row, which have pushed the team dangerously close to wooden spoon territory. This would have been unthinkable after a brilliant season last year when the Ghosts were just one match away from a premiership decider. But a slow start to the season and a few narrow defeats have conspired to dash the hopes for a successful season. The Ghosts lost by just 12 runs on the weekend. 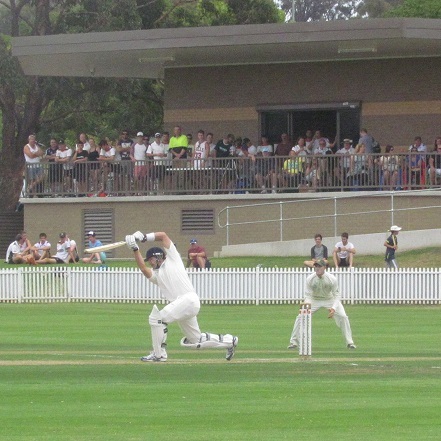 Such was the case again on the weekend when the Ghosts took on the Fairfield Liverpool cricket club in the SCA Rivalry Round to play for the Arthur Watson Cup in first grade. Fairfield Liverpool batted first and compiled 187 off 83.2 overs, which proved enough for them to claim the Arthur Watson Cup. Webb (3 for 43) and Courtney (4 for 59) were the main wicket takers for the Ghosts. In reply, the Ghosts were dismissed after 59.4 overs for 175 runs, 13 short of victory. Oliver Robinson with 36 was the top scorer for the home side. The defeat, which has come on the back of another narrow loss on Australia Day to Sydney University, has left the Ghosts languishing near the bottom of the ladder. They are now second last with 26 points, just seven points ahead of bottom placed Manly. In round 13 Ghosts host fellow battlers St George in a two day game at Raby 1 from this Saturday. No doubt both teams will be desperate to bag the six premiership points to help them get away from the dreaded wooden spoon territory.